Here is a brief and helpful article from Steve Smith at Mission Frontiers: 4 Stages of a Movement. For me, it quickly helps explain some of the major tensions/issues that arise when a Kingdom movement breaks out in an unreached people group (UPG) who are near-culture to a institutional church. Well meaning institutional church leaders often use their own paradigms of training for equipping emerging leaders in the movement phase (stage 2) which may actually threaten the movement. Unfortunately, these same emerging leaders often quickly try to mimic an institutional church which is inappropriate and unsustainable at that time. Similarly, new believers in UPGs who have been taken out of their contexts for short-term training often feel they need to aim for the institutional church far too soon. [Stage Two Workers in Stage Four] What happens with believers from stage one or two who visit leaders and churches in stage four? A not-uncommon consequence is death of the movement phase and immediately entering the formalizing and institutional phase. The challenge is to keep a movement at the movement stage as long as possible and to not let the formalizing impede the progress of the kingdom. But when it does begin to slow down, going back to simple biblical processes and methods of earlier stages can spark a new movement. I find the following statement a little provocative, “we have to ask whether it is fair to expect a movement to survive only as a movement. Either the movement disintegrates or it becomes an institution, this is simply a sociological law. Every religious group that started out as a movement and managed to survive, did so because it was gradually institutionalized” (Bosch 1991, 52)." I wonder what is meant here by the term "institutionalized". In my understanding, the church of Christ WAS a movement until the Edict of Milan 313, or possibly until the Coucil of Nicea (325). If a movement can remain a movement for nearly three hundred years, why could it not remain longer? In those nearly 300 years, it was steadily growing and thriving. I don't think there is any substantial historical proof to show that it would have died without its being legalized and becoming more institutionalized. I really liked your comment on the need for the church to continually renew itself. There are some denominations that I have run across such as the "Deeper Life Church" in Africa, which still functions like a movement in many ways while also having some loose structure. At what point do we say something has become "institutionalized"? That is a good question that I believe needs to be researched. I would say, though, that I think there are different models of church in the NT, and that the institutionalizing process happened much sooner than you suggest. I would even think that there are hints of it institutionalizing in the NT itself. But that begs the question, what is "institutionalized." Are the terms "movement" and "institutionalized church" mutually exclusive? If a movement created networks within itself for sharing resources, spiritual gifts, and Biblical insights, and if it created training centers and appointed leaders over the movement because of their spiritual gifts of leadership and Biblical qualifications - would it then be less of a movement? Could it not continue to maintain the priesthood of believers, roles based of spiritual gifting, and rapid multiplication? Can there be an "institutionalized movement? That is certainly open to debate. But I think the nature of the institutional church is that it (can) grow bigger, but it has a really hard time multiplying. 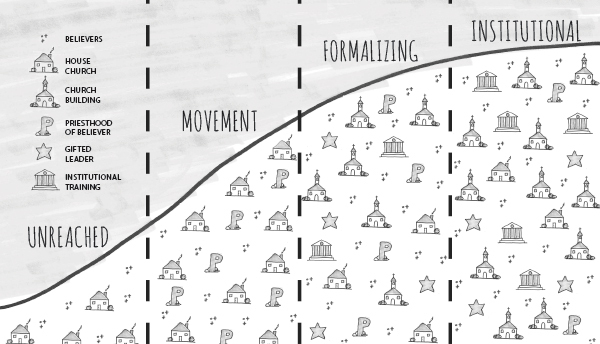 Movements are much more likely to multiply, esp when the church is viewed as a family. Families multiply and have generations. But the institutional church usually just tries to expand but not necessarily reproduce. If it does, it usually very slow and needs a lot of resources, which is hard to start a movement in. If an institutionalized church began to apply the principles of "the priesthood of believers" and then began to rapidly reproduce and multiply, would we then call it a movement? There are several instances of this kind of thing happening in history. So if your answer is yes, then perhaps there is not only a natural process of movements eventually becoming institutionalized, but also a natural Spirit-led process of instituionalized Christian groups becoming movements again?